I am thankful Family Friendly Gaming was given a code for Spheroids on the Wii U. This downloadable only home console video game with off screen play takes the old Buster Bros concept and fleshes it out into a full 2D side scrolling game. What does that mean exactly? Spheroids is an indie 2D side scrolling game with gadgets like a grappling gun and has blob like characters that break apart when hit. I noticed there are set areas in Spheroids that are just like Buster Bros. Families can run, jump, grapple, and more in Spheroids. Then we come to parts of the level where we need to break apart all of the Spheroids to continue on. Thankfully there are enough power ups and upgrades in Spheroids. I noticed it was very smart to collect the gold coins in Spheroids and use them on upgrades in later levels. Spheroids has retro graphics. There are thirty-two levels in Spheroids. This Wii U Nintendo eShop only video game is selling for $7.99 as I work on this review. The levels have multiple continuations points in them. There are also cut scenes in Spheroids where two characters converse. This is how we learn about new enemies, environment features, and gadgets. I like Spheroids. I had fun playing it. I also enjoyed getting through the levels. Is it violent to break apart these one eyed blob monsters? I don't know. What I do know is we see where our character last died when we continued. The main character is blocky. To me that is at the very least an ESRB descriptor of Comic Mischief. Maybe even an ESRB descriptor of Cartoon Violence. Families have given up on the ESRB giving accurate descriptors years ago. Family Friendly Gaming continues to point out when and where they miss things. The grappling hook is a fun way to swing in Spheroids. I like the music in Spheroids. It kept me interested in playing this game. I could not get the music to work with the off screen play. Not sure what the problem was there. I wish Spheroids had more levels for the price. 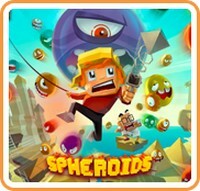 A physical copy of Spheroids would be pretty neat for the video game industry. Maybe that will happen in the future.